MADD honors officers for DUI arrests The Buena Park Police Department proudly announces Officer Patrick Bates as a recipient of the Century Award. On March 31, 2014, Mothers Against Drunk Driving (MADD) hosted Orange County's 27th Annual Law Enforcement & Prosecutor Recognition Luncheon at the Richard Nixon Library in Yorba Linda, California. We are proud of our own Buena Park Police Officer Patrick Bates. This award was given to 14 officers representing various law enforcement agencies in Orange County. It required a minimum of 100 arrests for driving under the influence (DUI) of alcohol and/or drugs. These officers were recognized for being real heroes, as was noted at the event: "Not all heroes wear capes!" These officers represent the top of the class in their efforts to stop drunk drivers from continuing down the road of destruction. As we all know and have heard too often, drunk driving is a choice that is not only a crime, but is responsible for hundred of serious collisions. Out of the 14 officers who were honored County-wide with the Century Award, Officer Patrick Bates was one of the second highest in our County. He removed 124 impaired drivers from our streets during 2013, which represented approximately 62% of our total DUI arrests Department-wide for 2013. This is the 3rd year in a row that Officer Bates was recognized by MADD for his diligent efforts in preventing numerous traffic collisions and taking drunk drivers to jail. 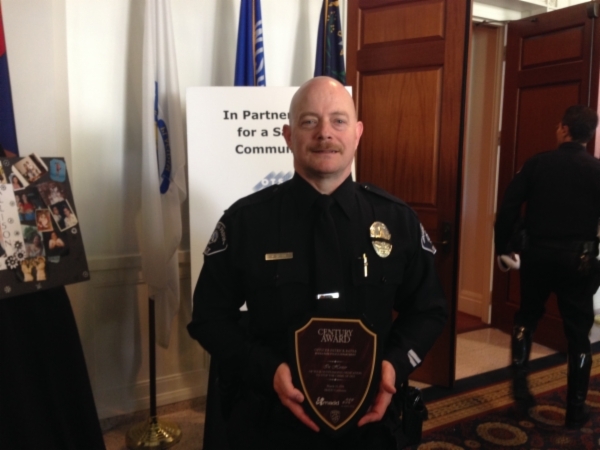 Congratulations and our hats off to Officer Patrick Bates.